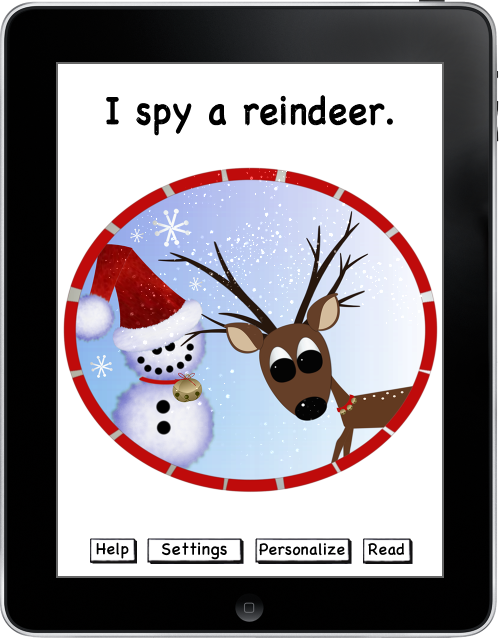 This FREEÂ app, narrated by Cambria Harrington, isÂ available on iTunes..
Lorrie Ann Harrington originally created this Christmas story to teach her son, who has Autism Spectrum Disorder, new vocabulary, language-based concepts, and social communication skills. This pronoun is used repeatedly throughout the book with a special page designed to teach the relationship between the pronouns â€œIâ€ and â€œme.â€ In addition, the story is structured in such a way that it can be used to help teach children to identify, label, and categorize words and concepts, by commenting on the text and pictures. “Subtle animations, sound effects, background music and narration” can all be adjusted to match the needs of the learner.